OIL: BURN IT OR SHOVE IT? “MAXIMISE oil recovery!” That is the blunt message from the Commons Scottish Affairs Select Committee this week. The committee is chaired by the feisty if conservative Pete Wishart, SNP MP for Perth and North Perthshire. Pete is no fan of an early IndyRef2. The committee’s report reckons (not unreasonably) that there’s potentially another 30 years of oil and gas production in the North Sea and west of Shetland. Of course, as I always point out, oil companies habitually fib about their hydrocarbon reserves – too little and the share price crashes, too much and the management is accused of wasting capital. Besides, there is a big difference from what’s under the ground and what you can extract at a profit. To ensure we get this extra oil and gas, the Wishart report recommends the UK government provide a subsidy of circa £170m to “support the sector in exporting its skills and expertise around the world” and to “transfer the sector’s world leading engineering into other sectors, like renewable energy and carbon capture technology”. The report claims such an investment will help uncap £110bn of production. 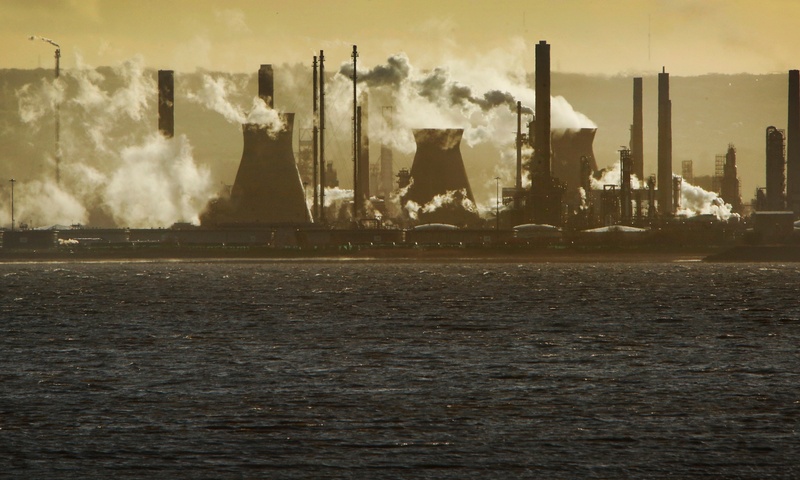 The problem is that maximising oil and gas output, especially in an independent Scotland, is clearly at odds with fighting climate change through rapid de-carbonisation of the economy. This political dilemma jumps out of the report despite constant references to using North Sea oil technology and skills for green energy production or chasing the hideously expensive chimera of carbon capture. The report estimates the UK Continental Shelf (UKCS) has between 10 and 20 billion barrels of oil equivalent. If we extract and burn an extra 20bn boe from the North Sea, that equates to some 9 billion tonnes of CO2. Put another way, that’s the equivalent of building 20 new coal-fired power stations and running them continuously for 50 years. While we’re on the subject, when are politicians going to stop offering to bribe Big Oil – one of the globe’s cash-rich industries – with public money? The oil majors are currently awash with more dollars than they’ve had in a decade. This is because (1) the notoriously bloated energy giants have been forced by the 2014 price crash to improve their operating efficiency; and (2) they have moved to extract extra profits from refining and trading in hydrocarbons. Plus, of course, oil prices have gone back up again. BP’s 2018 Q3 profits struck a five-year high at $3.8bn, up from $1.9bn in the same period in 2017. BP is so awash with money it bought BHP Billiton’s shale business for $10.5bn cash on the nail. French Total’s third quarter profits were up 48 per cent. ConocoPhilips quarterly profits quintupled to nearly $2bn. ExxonMobil’s third-quarter returns were $6.2bn, up 57 per. Shell registered its biggest profits in a decade – returns that literally blew analyst estimates out of the water. The oil monopolies have so much money pouring in, they don’t know what to do with it. So they are happily buying back their own shares with the surplus cash. This has the added advantage of raising share prices, thus delivering mega bonuses to senior executives on performance-related salaries. In July-September last year, Shell spent $2.5bn on share buy-backs, Chevron spent $750m, Total spent $500m, and BP spent $140m. So Pete, why do these firms need a state subsidy, even a piddling one (by their standards) of £170m? Why don’t we follow the Norwegians and run the industry publicly, thereby keeping all the profits? We urgently need to de-carbonise and we need to make definite progress by 2035 or risk global heating getting uncontrollable. But there are real problems. Even allowing for renewables and a boom in electric vehicles, current infrastructure means that oil and gas will still provide two thirds of UK primary energy needs till circa 2035. Some 80 per cent of homes are heated by gas and 65 per cent use gas for cooking – I’m a culprit myself. Conclusion: state investment and tax incentives have to be focused on home insulation, community heating schemes and electric cookers. That might be a better way to use Pete’s £170m bung to Big Oil. Scotland has one advantage in that we didn’t go far down the road of substituting gas-fired electricity for coal power, as happened in England. We’ve swapped our coal-fired electricity for wind power. So we don’t need to replace big gas plants. Also, domestic and industrial demand for heating gas has declined in Scotland over the past decade. Which means we might conceivably be able to replace burning conventional natural gas (which produces greenhouse CO2) with pure hydrogen, made using electrolysis powered by wind. I’m generally suspicious of such technical “fixes” as they invariably are more difficult and expensive than starry-eyed advocates pretend. Nevertheless, we need to do something quickly to de-carbonise, and the hydrogen route has the advantage we can use existing gas infrastructure. That is provided there is enough wind energy to feed the hydrogen plant. Mike, You ask a very valid question that needs answering. I also ask the question when can we expect to see a battery powered A380 flying non-stop to Australia with upwards of 400 passengers??? Hydrogen production is being mooted as a means to store wind energy when it isn’t needed or can’t be put into the main grid. For example, on the islands; at least one of which is looking at running their ferry off of hydrogen produced by their turbines when they’re generating more than is needed for daily use. 10 billion barrels of oil is 10,000,000,000 – the planet uses 100,000,000 a day, so what’s that, 100 days worth? How many years will it take to extract that 10 billion barrels? 10? 20? The insanity of the fossil fuel industry, accelerating the demise of its very own customers…. In part 1 (oil burn it or shove it) George says that ‘maximising oil and gas output … is clearly at odds with fighting climate change’ – no problem with that – but by part 2 (subsidising big oil) he’s asking ‘why don’t we follow the Norwegians and run the industry publicly, thereby keeping all the profits?’ So within a paragraph or two he’s abandoned the fight against climate change and is comfortable with extracting, selling and burning the oil so long as the cash goes into a sovereign wealth fund! So is George Kerevan in agreement with the recent Wings over Scotland article on north sea oil? And if he is why is the above being published on Bella Caledonia? What are the SNP doing on all these Select Committees, shouldering their weight in running UK PLC? Hey Red, and would SNP get the necessary vote to achieve being elected to a majority? If the SNP get to run Scottish independence negotiations, we’ll end up with something half baked / watered down.. in fact, it will never happen if they are in charge. Just like we got with our PRETENDY PARLIAMENT, which ISNAY ACTUALLY A PARLIAMENT… despite the Scottish literati getting all excited back in the day. People were crying!!! Poor Edwin Morgan!!! The man will be turning in his grave!!! “Open the windows, let in the light!” he wrote full of joy and enthusiasm…. what happened to that? Brexit is the opposite: Shut all the windows and bolt all the doors. Nobody is leaving this room!!! Here’s the central truth nobody wants to face up to: Wishart, Wilson and Robertson have got much more in common with the south of England bourgeoisie than the Scottish working class, and if push comes to shove, my bet is that they would rather be governed by the south English bourgeoisie than the Scottish working class. The Queen has an especial bonding with Scotland. She will be returned once one her pawns reaches the other side @TheRealDonaldTrumpRealE-State Just be aware of the Equine Flu Virus it May wipe out A realToryQuine on BREXIT Day. Bella and Christina are safe under Scotland Wings. The Chief Engineer is playing a great game with US. Excellent synopsis Redgauntlet. The Yes/No conundrum inevitably comes down to culture, and language which forms the basis of culture – Anglophone/No and Scotophone/Yes appears to be the way things are. The SNP didn’t even consider bringing in a Scots Language Act, which I suspect would be one of the first things any ‘Nationalist’ government anywhere would have done after a prolonged period of cultural and language oppression. As the Yes/No vote is at root culture/language determined one would have thought the SNP could have done much more for the Scots language not least because it is the lifespring of future Yes voters. If you are an elected member of a Parliament of an ancient Nation, and the courts find that your Parliament has no Constitutional status, do you not stand up and walk out that Parliament and refuse to come back until that situation has been remedied? Does that not piss you off so much, and make such a mockery of the people you purport to represent, that you walk out of their Parliament and come back to Our Parliament and start seriously fighting to make sure that Our Parliament ceases to exist at the mercy of their Parliament and their Courts? Or instead, do you attend more parliamentary committees in their Parliament about how to extract our natural resources so that their Parliament can go and bomb yet another defenceless nation into submission? On a wet Friday morning which is also a holiday, I read George Kerevan`s piece with interest and I have also read the Scottish Affairs Select Committee Report cited. I have worked in the oil and gas business since 1983 and I have a few points to make. 1. George characterises the £170 million overall spend recommmended by the report as subsidising “Big Oil”. In fact the £170 million is to be spent on three seperate hub/research projects to advance the sector generally and to assist the export of Scottish engineering technology. As George concedes this is a very small amount. I do not see this as being a “bung” to Big Oil. The real benificiaries of the £170 million programe are likely to be the Scottish/UK supply chain. I think the Committee is sound on this. 2. George characterises Big Oil as being monopolists. While it is true that any oil company with a licence to drill is in a sense an monopolist ( because the company necessarily has a monopoly of exploration and production over the block) the oil multi-nationals are not monopolists in the usual sense because even Exxon has only a small share of overall World Production. The oil monopolists, George tells us, are making huge profits because of a higher oil price ( for which I personally give thanks) and because of enhanced efficiency ( which is certainly true). They are also taking extra profits through refining and trading. But Shell,BP etc have always engaged in refining and trading. What is new about that? 3. ” Why don`t we follow the Norwegians and run the industry publicly, thereby keeping all the profits?”. Jim Sillars makes a similiar sort of argument. Firstly, we should note that the Norwegian system is not wholly public as it allows numerous private players. But it is true that Norway has high oil and gas taxes and high levels of state ownership. Why will this not work in Scotland? The principal reason that in order to replicate the Norwegian levels of state ownership there would need to be masssive nationalisation. If this was to be done at market value, the cost would be incalculable. If it was to be done with little or no compensation then there would be a collapse in business confidence and the rule of law. Think of Venezuela where this very thing happened. In short, George is suggesting another Marxist day-dream. One last thing to remember about Norway George, is that Norway is simply sitting on much better assets and much better geology than the UK. Go back two Oil & Gas UK annual reports and you will find a fascinating section in which it is pointed that Norway`s best single asset Troll, is more valuable the the top 20 UKCS fields put together. Norway, as Norwegians say, works very well in Norway.